I can’t believe that it has been 3 years since I’ve blogged. My absence has not been due to a lack of lost pet recovery content but rather due to a lack of TIME. However, the explosion in Facebook lost pet recovery teams as well as increased interest by animal shelters to develop lost pet recovery programs has led me to realize that more than ever, people NEED to be educated in what to do and what NOT to do when it comes to recovering a lost pet. The first topic I want to cover is the issue of whether or not pet owner / guardians should offer a REWARD for a lost pet. It used to be that we advocated offering a reward (UPPER LEFT PHOTO) because, well, it just seemed to make sense. In our early days (MPP was founded in 2001, long before Facebook was born) we saw cases where a high dollar reward resulted in media attention and/or the person who’d found a missing pet came out of the woodwork in order to claim the reward and return the lost pet. 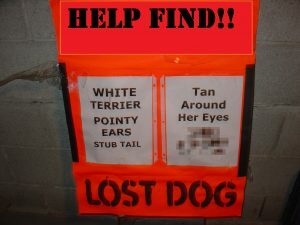 However, as Facebook Lost & Found pages have developed in most communities, their administrators have seen a disturbing trend: in many cases where a lost dog has been sighted and a REWARD was offered, Joe-Blow-Citizens have rushed into “rescue” mode when they’ve heard of a sighting or they themselves spotted the dog. And what these people end up doing is CHASING the dog. We’ve heard of several cases where volunteer teams had been working to capture a skittish lost dog through passive means such as Calming Signals or feeding station, wildlife cameras, and humane dog traps, only to have that lost dog chased out of the search area. And worse yet, some dogs have been chased into traffic, struck by a car, and killed. So, after hearing enough opposition to the issue of offering a reward, I decided to do a bit research to see what science says about rewards. I was shocked at what I discovered! 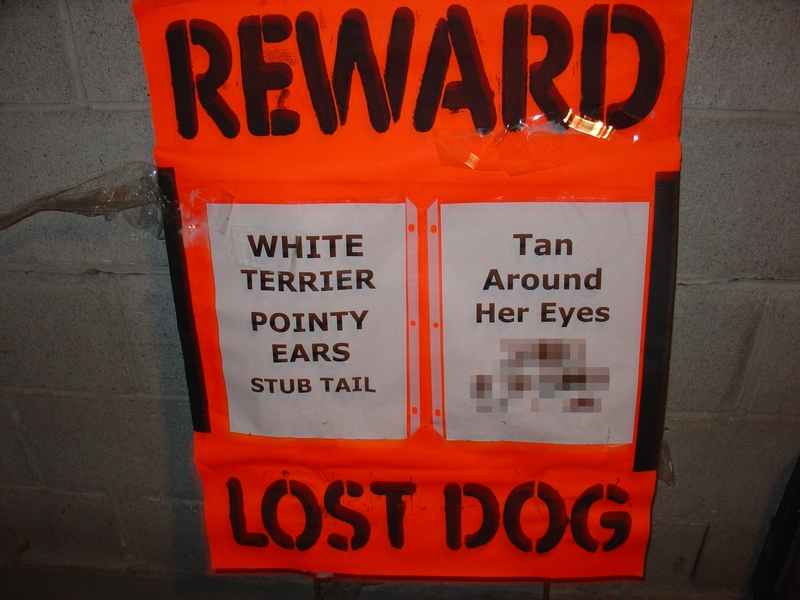 Many people (including myself) have thought that using a reward would be a worthy motivator of people to get them to help call in a sighting of a lost pet. However, scientific research has actually shown that monetary incentives are NOT the best motivator at all! In one study in Switzerland, researchers discovered that in a case where a small community was faced with building a toxic waste dump outside their community, over half of the townspeople were willing to approve this measure because for the sake of a different nearby community it was “the right thing to do” for them to help out by having the dump by their own town. But the builders, in their attempt to gain even more votes, offered to compensate all community members with a few thousand dollars a year. Surprisingly, when offered this perk nearly everyone changed their minds and voted against the dump. Whereas initially almost half of the people were willing to live next to a toxic waste dump for free because it was “the right thing to do” they changed their minds when they were offered money. The National Institutes of Health (NIH) has pinpointed the neurophysiology behind this and behind the issue of offering a reward verses simply asking people for help. In one study, the NIH conducted MRI’s to monitor brain activity and discovered that there are two very different areas of the brain that process thoughts of either seeking financial compensation or of being charitable. There have also been other studies of the brain related to monetary incentives vs. alturism. These studies have shown that these two areas of the brain can NOT operate at the same time and that either one or the other kicks in when we are thinking. I have never been afraid to admit that I am wrong. We’re switching from suggesting posters with “REWARD” to instead say “PLEASE HELP” or “HELP FIND!” We’ve including information about “Inattentional Blindness” and the science behind WHY large, neon posters (verses tiny, white, 8 1/2 X 11 flyers) are a highly effective tool to recover a lost pet. 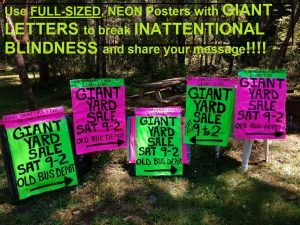 This simple technique of learning how to create proper signs will even help change the way you make yard sale signs, like these ones I made last year! 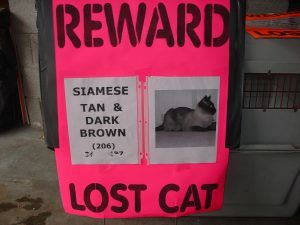 From now on, I personally will no longer suggest that pet owners offer a reward or advertise that they are offering a reward (the exception being LOST CAT cases–there is much less risk of people chasing after cats, most will duck and hide in or under something, and sightings of displaced cats are CRITICAL to knowing where to set up a wildlife camera and/or humane trap), since doing so may encourage untrained people interested only in financial compensation to chase after lost pets, leading to tragic consequences. At the very least, offering rewards can make a recovery by trained professionals and/or community volunteers very difficult when untrained community members become involved. 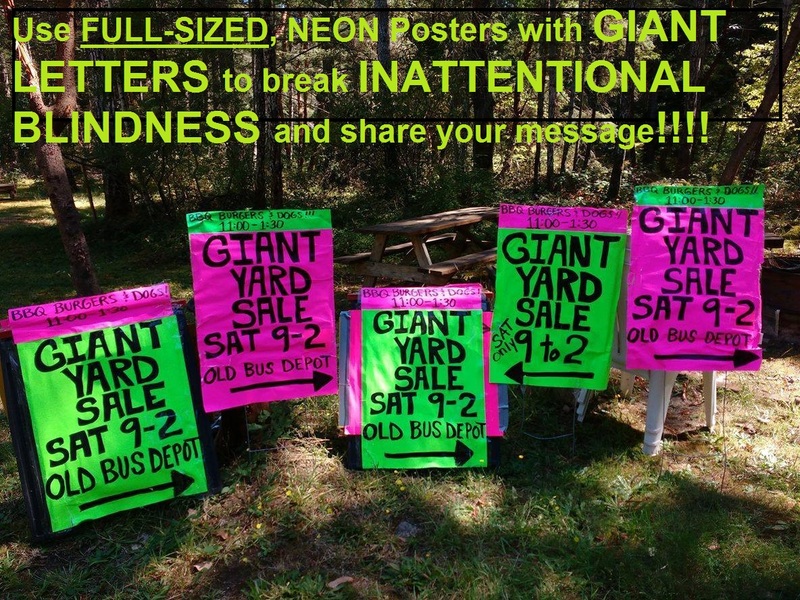 Instead, use social media and community networking services (like NextDoor.com) to get your message out. 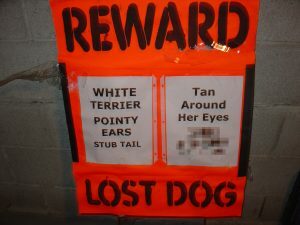 When you consider that most communities have a Lost & Found Facebook page (check out Lost Dogs of America’s site) with volunteers who love animals and who REALLY want to HELP find your missing pet, there is no need to appeal to the “nucleus accumbens” reward-seeking-crowd in your community. 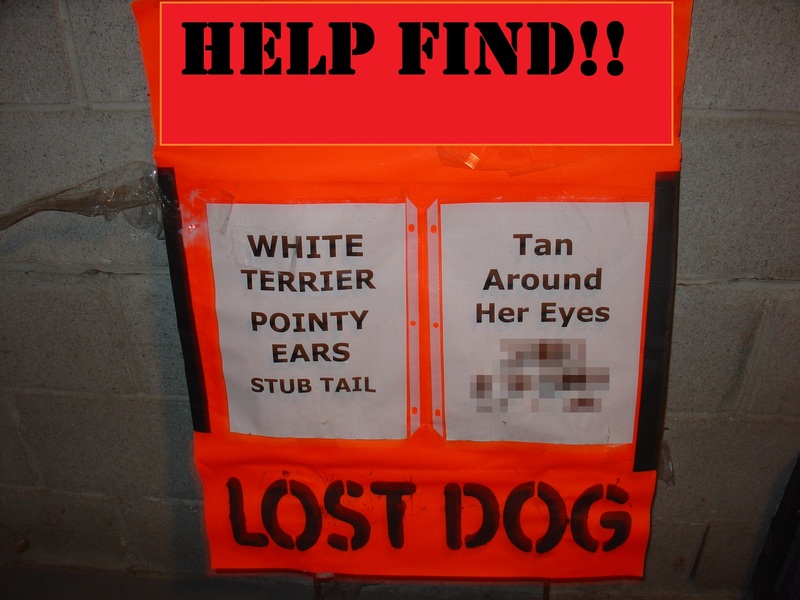 Instead, find your local Lost & Found Facebook page, follow their instructions on posting your lost pet, and appeal to the animal loving-posterior superior temporal sulcus-crowd by creating a poster that says: PLEASE HELP! When you do that, you’ll have a better chance of getting just what you need….HELP!